Until I started visiting my local farmers markets I had no idea cauliflower came in colors other than white! How can I resist purple or orange cauliflower? I'm not a matchy-matchy person but I have to admit that either of those fun colors just matches my Halloween decor perfectly. We of course also love to eat cauliflower, especially roasted. The crispy bits are my favorite part. Last night we opted to go Italian with the seasoning and I think we have a new favorite on our hands. In a large bowl combine rosemary, olive oil, salt and pepper. Add the cauliflower pieces and toss until well combined. 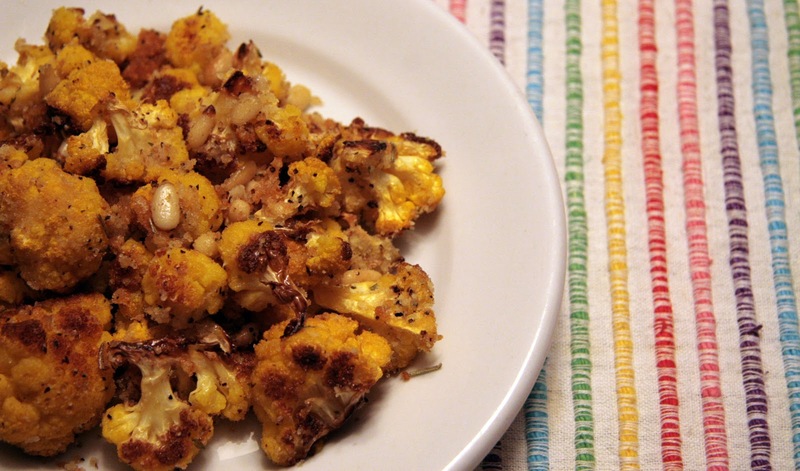 Spread out the coated cauliflower pieces on a rimmed baking sheet and roast in the oven for 20 minutes. Meanwhile in a small bowl combine the pine nuts, bread crumbs and Parmesan cheese. After 20 minutes, remove baking sheet from the oven and sprinkle the Parmesan mixture over roasted cauliflower. Place back into oven for another 10 minutes until golden brown. I think hazelnuts would be a interesting swap for the pine nuts. I only had traditional bread crumbs on hand, but no doubt that Panko would add an even better crunch.